The conflict between Israel, on one hand, and the Palestinian Arabs and the Arab states, on the other, has exacted a terrible price from ordinary people on both sides of the divide. Since the signing of the 1993 Oslo peace declaration until today, some 1,650 Israelis were killed in terror attacks by Palestinian Arab groups; several times that number have been injured. Add to this the 22,000 soldiers killed in all the wars and the circle grows exponentially. Tiny Israel, with its population of 7 million, carries an extraordinary burden of pain. 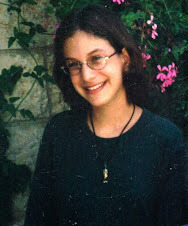 We, the writers of this blog, became a part of the circle of tragedy and grieving when, on August 9, 2001, the life of our fifteen year-old daughter Malki was stolen from her and us by Hamas terrorists in a devastating attack on a restaurant filled with children in the heart of Jerusalem on a hot school-vacation afternoon. As we later learned, children were explicitly the target. Jewish children. Some, among Israel’s victims of terror, mourn privately and keep their distance from public controversy. Others speak up or join advocacy groups that reflect wide ranging views. 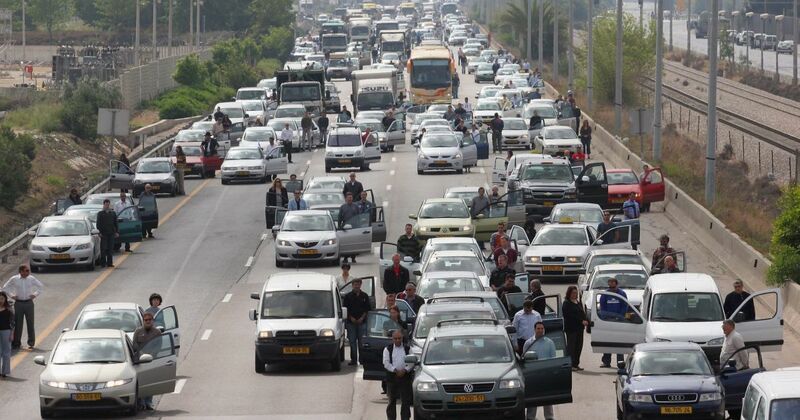 In Israel’s robust democracy, we have both the expectation and the inalienable right to do this. Against that background, we have viewed the activities of Parents Circle from a distance for more than a decade. It arouses deep disquiet within us. What follows here is our expression of that disquiet. We speak only for ourselves, and claim no right of representation. Some others feel differently. But from conversations with many families like our own, we know the sense we reflect here is widely held. Parents Circle was created in the nineties and claims to speak for five or six hundred bereaved Israeli or Palestinian members. It’s an unverified number that – curiously – has remained constant throughout the past decade. We think this is odd: thousands of acts of terrorism have produced thousands more terror victims on the Israel side alone. Yet the membership number they claim has remained constant in all that time. The Parents Circle mantra is moving, universal and non-partisan: “Supporting Peace, Reconciliation and Tolerance”. How can anyone be opposed? Who doesn't yearn to see the fulfillment of these precious and elusive objectives? But do the words and actions of Parent’s Circle match the aspiration? We believe Parents Circle leverages our collective bereavement to secure funding for advancing a very specific and particular political line - a line even they concede is unrepresentative of Israel’s bereaved families. Reviewing the public statements of Parents Circle’s key figures over the past decade, a consistent and depressingly familiar political agenda emerges. The Israelis are the aggressors. The Palestinians are the victims. The occupation is at the heart of the conflict. And as for the role of the terrorists, their ideologies and decades of Arab rejectionist politics – that is simply absent. The bulk of their money comes from non-Israeli sources, mainly political bodies and governments, according to the data they publish to satisfy their legal obligations. That the problematic nature of what they do is made possible by mainly foreign funding, and much of it from foreign governments and foreign government agencies, is disturbing. Their message adopts the language of bereavement. But in reality it is highly political, and it is perceived that way by their audiences. We feel that, to a great extent, their message is calibrated to meet the expectations of funders. She then compares Israel to apartheid-era South Africa where she was raised and lived. This bereaved mother/publicist is a Parents Circle insider who speaks and travels very frequently on Parents Circle’s behalf. 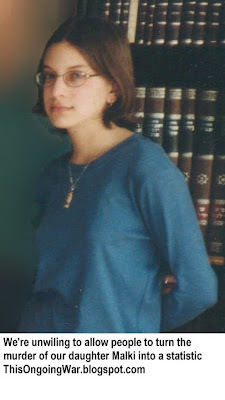 For her, the process that has turned the killer of our fifteen year old daughter into an international heroine throughout the Arab world is not worth talking about. We think it’s a strange, even offensive, outlook. But in a robust democracy like ours, it’s a legitimate one; people like us are left to suffer it and to speak out whenever the opportunities and audiences present themselves. However in the broader circle of bereaved Israeli families, let's be clear that the Parents Circle perspective is very far from representative. The majority of us have little difficulty in differentiating between the terrorists who bring bombs into Israeli restaurants or have them strapped to their chests as they get on a bus, on one hand, and the Israeli soldiers who seek out the killers and protect our schools. To say this more bluntly: when your child is murdered by Palestinian Arab terrorists, and the killers are elevated to heroes in Palestinian and other Arab societies as has happened again and again and again and again and again, most of us experience utter revulsion. We see the Arab attitude as a problem, even an impediment to eventual peace. This says nothing about our outlook on politics. Rather it indicates that the indiscriminate killing of civilians is repugnant in our eyes and very different from what the IDF does. The reaction of the Parents Circle spokesperson in the film suggests that her views are different from what we just wrote. For us, it smacks of a politicized position that happens to align closely with the Palestinian nationalist narrative, and that is arguably the engine that drives the deadly conflict. From the perspective of bringing peace and reconciliation, in what possible way is this beneficial? Parents Circle asserts over and again in its marketing that the good they seek to do is “an alternative to hatred and revenge”. It’s a phrase that occurs repeatedly in their documents. We realize now that the hatred and revenge to which they offer “an alternative” is what they want you to believe the rest of us feel. Parents Circle’s financial supporters are being asked to fund an alternative to the ‘hateful’, ‘vengeful’ viewpoints of families like ours. This claim, to us, is deeply repugnant. Then there’s the money. It provides the handful of people who regularly represent Parents Circle with the ability to appear and speak frequently in Europe and the United States. The organization’s 2008 filing (the most recent available when we last checked a year ago) with the Israeli registrar of non-profits reveals more than $2 million in funding from US government and European Union sources, plus additional grants from the governments of Spain, Switzerland, Belgium, Norway, the Netherlands and others. On top of this, there is the funding they get from the activities of their UK, German and American support arms. In all, this substantial budget allows messages to be delivered with great effect. From its published reports, one sees that much of the budget goes to fund speaking tours by Parents Circle insiders. This almost always means a pair of individuals in which one is an Israeli, frequently the same publicist/mother mentioned above, and the other a Palestinian Arab. The combination implies a kind of balance of views, and embodies the idea of dialogue between erstwhile enemies. We have listened to a sample of their radio programs and recorded speeches; it is made up of large doses of political ideology with an emphasis on (a) the Palestinian narrative where Israel is invariably the party at fault, and (b) on the offensive and wrong South African comparison. The messages of the Israeli and of the Palestinian Arab speakers are, politically, almost indistinguishable from each other. Under the banners of “peace-building” and “reconciliation” (their choice of labels), Parents’ Circle’s message is that peace will come from pressuring one side to the conflict, and one side only: Israel - of course. Consequently it is not so surprising that groups promoting BDS (boycotts, divestment and sanctions of Israel) including EAPPI, Sabeel and (until we personally intervened recently) rememberthesechildren.org acknowledge a close relationship with, and support for, Parents Circle. Note also that the endless acts of terrorism, incitement to terrorism, the widespread adoption of terrorist terminology and the terrorism-friendly agenda in several countries seem not to be on Parents Circle’s agenda at all, to judge from the speeches of the activists and their website. When you take into account the central role of the terrorists in the bereavement of the Israeli families, this is an absence worth noting. In contrast to Parents Circle’s message, most of the bereaved Israelis we know (unfortunately we know many) passionately reject the immoral equivalence the group’s activists imply between the victims and the terrorists. If we could reach the audiences whom Parents Circle addresses, we would tell people about our daughter Malki and her beautiful life. We would tell them that Malki did not die because of the “occupation” or a disagreement on narratives. She was murdered by unrepentant Palestinian terrorists who declare openly that they meant it and are proud of their deed. We can discuss real peace options based on mutual understanding with Palestinian Arabs. But first we must secure our families and our communities. To this, we know from bitter experience, there is no alternative. In its published materials, Parents Circle has claimed consistently and repeatedly over the years to hold “a thousand” presentations annually at some unspecified mix of Israeli and Palestinian Arab schools, addressing “25,000” students. If true, that would mean twenty assemblies every week throughout the year and with no time off for school holidays. From enquiries we have made, we think this is fanciful, and greatly oversold in the group’s marketing. We believe the organization’s real focus is in addressing audiences in North America and Europe, most of them churches, liberal radio stations and university campus groups. Observing from a distance, it appears these interactions represent the bulk of Family Circle’s activity. Though it is difficult to say how often, activists of Parents Circle do speak in Israeli schools. Reports we have seen from these events describe a heavily political message – made all the more powerful by the speakers being a seemingly balanced Israeli and Arab pair; this purports to satisfy Israeli Ministry of Education guidelines. That these pairs are given essentially unfettered access to rooms filled with Israeli pre-army high schoolers, and are thus able to convey a message that undermines the case for Israel, is deeply worrying. But here's the thing. If indeed they speak regularly in front of equivalent Palestinian Arab school groups, a claim strongly implied in their marketing materials, then at least two questions arise. One: why is there so little evidence of this on their website and in their materials? And two: What message do they deliver to such audiences? Does it advance peace, reconciliation and (especially) tolerance? The character of official Palestinian Authority and Hamas education policies in respect to understanding the Israeli side is well-known and, in our view, utterly hostile to the message Parents Circle claims to advance. If Parents Circle are indeed doing what they say and succeeding, that is not something about which to be modest. The flow of substantial foreign grants to this small, unrepresentative group of activists ought to be critically reviewed. We, the bereaved on both sides, deserve to be respected, heard and helped. But if the true nature of Parents Circle’s activity and support is, as we see it, narrowly political, then good people ought to acknowledge this and reach appropriate conclusions. Real change towards peace, reconciliation and tolerance is less, rather than more, likely to flow from their work. 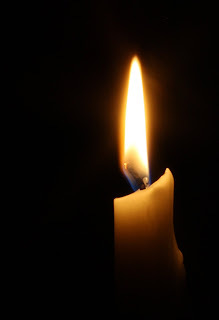 UPDATE Yom Hazikaron (Israel's Memorial Day) 2015: Out of a sense of deep pain and genuine puzzlement, we have found it important to write several more clarifications of what troubles us so much about the work of the organization described in this post. Click on Parents Circle for more.